In part I of this series we laid out a key challenge to housing affordability described by Washington developer Rob Stewart based on his experience working in development in the Washington DC area. Today we turn to a possible proposal, a kind of “third way” approach to housing affordability. Sometimes it seems like there are only two schools of thought when it comes to improving housing affordability, and they seem to be in diametric opposition to one another. There’s the market/supply side that says we need to adopt policies that encourage the private sector to build more housing, because more supply will tend to hold down, or even drive down rents. There’s the subsidized housing side that says the best (or only) way to provide affordable housing is to have the public sector subsidize its construction (through non-profits) or by requiring developers to build it as condition for building new housing (inclusionary zoning). This is of course a bit of a simplification: both strategies are important. But we heard recently of a new proposal being developed in Washington that doesn’t fall neatly into either of these two schools of thought. It recognizes that the market won’t fully provide for affordability, but also argues that the combination of inclusionary zoning requirements and subsidized (but expensive) new construction can’t provide enough units, and especially in the right places, to promote affordability and opportunity. Stewart and his firm are working with the Federal City Council in Washington DC on a proposal they call the Washington Housing Initiative (WHI), which aims to create more affordable housing units, more quickly, in neighborhoods that are on the cusp of change. The essential idea is to use a combination of private investment and public funds to acquire existing housing, and maintain its availability for low and moderate income households. Buying existing housing units is dramatically less expensive that building new units, and can be done much more quickly. The details of the initiative are spelled out in white papers on the WHI website. 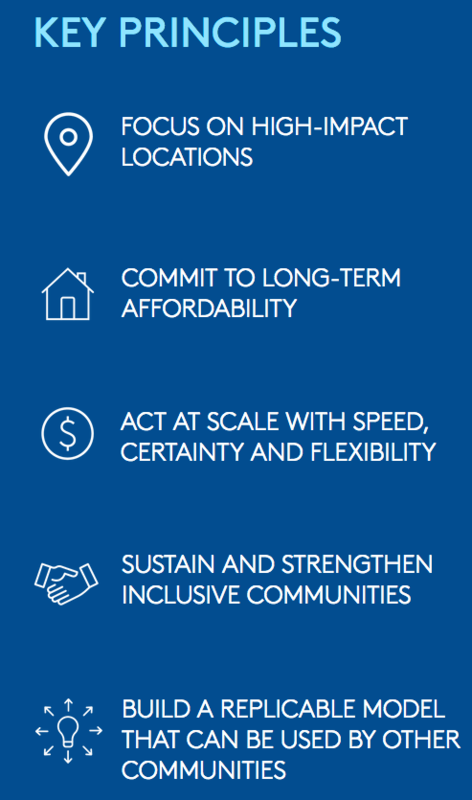 There WHI aims to have a lower cost of capital and lower operating cost that traditional affordable housing approaches. A key economy comes from taking a “fund” approach rather than a “project” approach to structuring financing. In most affordable housing projects, funding is arranged on a project-by-project basis, with each project consisting of a different set of actors, and funding sources, and with the added complexity of construction financing and site-specific risk. The WHI would be structured as a pooled fund, with financing not tied to individual projects, but spread across many projects. Because the fund is buying existing buildings, construction lending isn’t needed and other risk factors (approval or construction delays) are minimized. A fund, especially one led by private management, could be quick and nimble, and minimize overhead costs of acquiring properties. The WHI seems tailor-made for cities like Washington that are concerned about gentrification cutting into the supply of affordable housing and leading to neighborhoods that lose their mixed income character as the existing housing stock is upgraded. In theory, what WHI could do is purchase housing in neighborhoods that are likely to experience redevelopment and upgrading, and maintain a portion of these existing units for low and moderate income households. This would have the direct benefit of maintaining at least some income diversity in these neighborhoods as they develop, and as Stewart points out, would be far less costly than building entirely new affordable units in these neighborhoods. A fair argument could be made that this approach, unlike subsidizing new construction, doesn’t directly add to the supply of housing. While it may preserve some units for low or moderate income households, it doesn’t increase housing supply which is a key to holding down rent increases market wide. That’s a reasonable concern, but there are at least two mitigating factors: first, the higher income households that don’t end up occupying the units owned by WHI are a viable source of demand for other housing in the region, including especially new market rate housing. To the extent that private developers don’t buy, remodel, and raise rents on existing housing, they are more likely to pursue private development–so the WHI may effectively reallocate some of the demand for housing to new units. They key then will be, as we well know, whether local zoning codes allow increased development in desirable neighborhoods. The Washington Housing Initiative offers a provocative third way to tackle housing affordability, not relying solely on expanding the supply of housing via the market, and overcoming some of the cost, speed, and segregation problems associated with our traditional approaches to building new affordable housing in cities. Ultimately, it is likely to be a complement to, rather than a substitute for these other two approaches. If communities are concerned about the loss of income diversity in redeveloping neighborhoods–as they should be–this could be a valuable tool for keeping a portion of the housing stock affordable to low and moderate income households, and doing so more quickly and cost-effectively than by building new affordable housing units. That said, whether the strategy will help with overall affordability depends on whether local land use and development approval standards allow for the demand for housing by higher income households who might have otherwise occupied the units purchase by WHI to be met through new market rate development. We’ll be watching to see how this plays out.